“Walt Disney Co has agreed to buy filmmaker George Lucas’s Lucasfilm Ltd and the ‘Star Wars’ franchise for $4.05 billion in cash and stock, a blockbuster deal that adds one of the most beloved franchises in entertainment history to Disney’s lineup,” Lisa Richwine and Ronald Grover report for Reuters. “Lucas will become the second-largest individual holder of Disney shares, with a 2.2 percent stake,” Richwine and Grover report. MacDailyNews Note: Steve Jobs’ widow, Laurene Powell Jobs, is the largest individual holder of Disney shares. 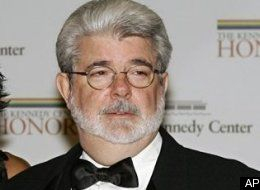 MacDailyNews Take: Thank God for beards or George Lucas would have no discernible chin. Oh, come on, you were thinking it, too. The good news is that any future “Star Wars” movies can’t be much worse than the last three. Gold bikini + Mickey ears and I’m in. 2.2% at 4.05 billion? Chewie!! It was half in cash and then 40 million shares of Disney. Maybe… Pixar and Lucasfilm are re-united under the very LARGE Disney roof. Steve Jobs to Luke : Luke, I am your owner. Make the Darth Bane trilogy into movies, if nothing else it can be an apology for 1,2 & 3. I REALLY hope Disney uses some of their talent from the Marvel Comics side of the house to do the writing and directing for Episodes 7 – 9. That would be great! Let’s hope they don’t use the JOHN CARTER talent instead! Ok. John Carter wasn’t that bad. Agreed. It was a good movie and it seems like the book of John Carter was the inspiration for Star Wars, Stat Trek and other SiFi. I had never heard of John Carter before and that was one of the problems. From what I heard Disney made minimal marketing since they believed every one already knew who John Carter was. It was an extremely expensive movie to produce, $400 million but no one would have coma ones about that if it took in like $600 million. After the “economic” flop that was John Carter everyone started attacking the movie which I think was wrong. I am happy Disney took the step and produced the movie. Do I smell a Star Wars Theme Park coming? It will be interesting to see which direction Disney goes first — back to the Old Republic days (pre Episodes 1-3), or continuing on with a galaxy not so long, long ago with Episode 7 and after. You almost have to go 7,8,9 before Mark Hamill is TOO old. Bad enough Harrison is already like 75. Time for a new cast and direction. Harrison Ford reprising Hans Solo would be as painful as William Shatner and Leonard Lemoy reprising Kirk and Spock. Way back when (after 1 [aka Episode 4] came out), the plan was to do 12 movies. Lucas spoke publicly about this plan several times. Then after 2 [aka Episode 5] came out and Lucas saw that doing 12 would be a major grind, the plan was to do nine movies. Do 4, 5 & 6 then while the actors age naturally, do 1, 2 & 3 (the prequels). Finally, do 7, 8 & 9 with the original, now older, actors heavily in 7 and less and less through 8 & 9. A, B, C, 1, 2, 3, 4, 5, 6, 7, 8, 9 (using the current numbering for Episodes 1 through 6) with 7, 8 & 9 being done first. Maybe in A we see a young Yoda? Even if you go completely new cast, Luke (Hamill) is the last known surviving Jedi. You need more than a 5 minute cameo to give you the push into the new direction. Either way, summer 2015 is not so far away that we wont be hearing rumors by next summer. We’ll be watching your career with great interest! Boy! This can’t hurt Apple. Disney has been on board with Apple’s movie/television desires. This makes that cooperation that much more important. I’m not saying that this will make the Apple iTV happen but it will get it a little bit closer. And I for one believe that it will happen. And not that far in the future. The studios and cable operators are going to be a difficult challenge for Apple but I just think that it will come to fruition. And I think it will happen in 2013. As sure as daylight, Apple an Disney will dance and soon. Third time is a charm, go for it.